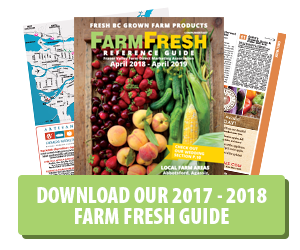 Kale Salad with Roasted Fingerling Potatoes, White Beans, and Warm Bacon Dressing is a delicious meal in itself or a great side dish for just about anything. 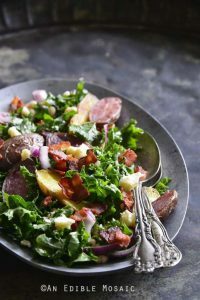 A great salad that combines the nutritional power of kale, delicate fingerling potatoes and everyone’s favourite; bacon! Preheat the oven to 425°F. Toss the potatoes, oil, and black pepper together and spread out on a large baking tray. Roast until the potatoes are tender inside and starting to crisp outside, about 30 minutes, tossing once halfway through. Meanwhile, add the bacon to a medium-large skillet over medium-high heat and cook until crispy, about 5 minutes, stirring occasionally. While the bacon cooks, toss together the kale, red onion, lemon juice, and salt in a large bowl and let it sit. When the bacon is crispy, use a slotted spoon to transfer it to a bowl. There should be about 2 to 3 tablespoons of bacon drippings in the skillet (if there is more than that, discard the extra); to the drippings, add the vinegar, honey, Dijon, and black pepper. Turn the heat down to low and whisk until combined; remove from heat. While the dressing is still hot, carefully pour it onto the kale mixture and toss to combine. Toss in the white beans. Pour the kale mixture onto a serving platter. Top with the roasted potatoes, crisped bacon, and crumbled cheese. Serve. Stella Fontinella Cheese: If you can’t find this, you can substitute shaved Parmesan, Romano, or Asiago.